For Christmas in 2007, Jeannie Spencer gave her musician husband, Richard, a gift certificate to a recording studio. Finally—at least in theory—he was able to book some time for himself guilt-free and create the recording he’d been planning in his mind for so long. The much-appreciated gift, however, presented Richard with an unexpected challenge: finding uninterrupted time during which he could actually put his ideas to paper and write the songs he wanted to record. Though neither Jeannie nor Richard could have known it at the time, that small gesture from a wife to her husband and the unexpected challenge it presented would plant the seed of a new idea that would finally blossom during the hot, dry summer of 2015. 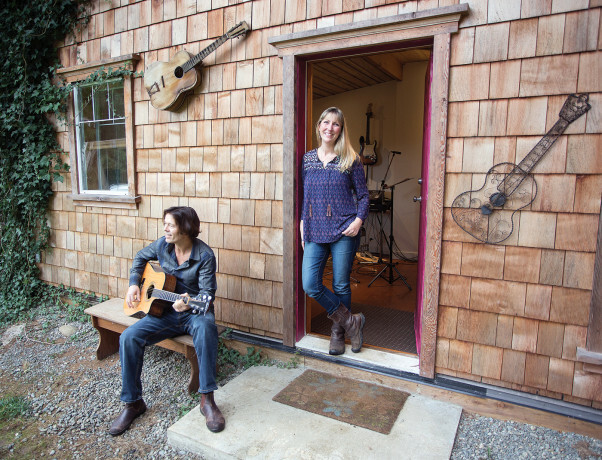 This past July, on MusicFest weekend, the Spencers welcomed their first guests to the “Comox Valley Recording Studio Getaway,” their brand new vacation rental that aims to solve that perennial problem of part-time musicians. So that’s exactly the kind of getaway they created. 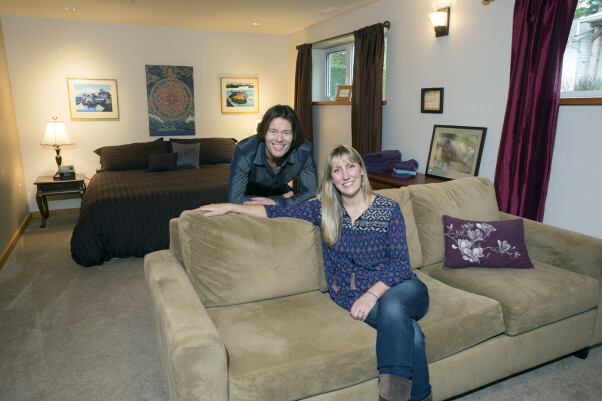 Until July, Jeannie had been operating a hypnotherapy practice out of the ground floor of their West Courtenay home, which they’d renovated to suit the purpose. 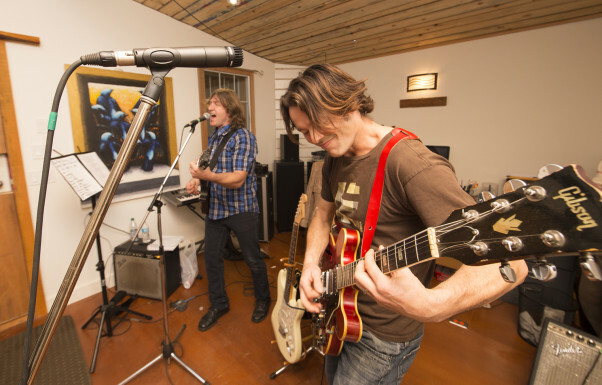 When she moved her practice into a new office in Tin Town, the Spencers suddenly saw the opportunity to create the kind of space that Richard, and presumably countless other musicians, had been longing for. Any hotel, vacation rental or B&B, of course, can provide a place to escape the chaos of day-to-day life and focus on the task at hand—be it creating a musical masterpiece or writing the great Canadian novel. What makes the Spencers’ getaway unique is what Richard, a contractor by trade, built in the backyard four years ago. While guests relax (or work, as the case may be) in their tastefully adorned three-bedroom vacation rental for as little as $72 a night, they also have access to a homemade, purpose-built recording studio. Guests of the Getaway can get an entire day in the recording studio for just $200—a substantial discount off Richard’s going rate for booking the recording studio on its own, and a fraction of what musicians would likely pay for studio time elsewhere. Within that rate, Richard also includes his time mixing and mastering the recordings, and he’ll even work with artists to add depth to their recordings by way of extra drum, guitar or bass tracks. “Sometimes a little extra bass or some subtle backing vocals are all you need to add a bit of complexity to your recording and really take it to that next level,” says Richard. Jeannie is decidedly less modest about her husband’s musical prowess. A quick glance at Richard’s musical resumé instantly confirms Jeannie’s inherently biased perspective. (And with an Airbnb profile that refers to him as “Rock God Rich,” it had better!) His projects have ranged from a children’s CD called Dragonland to his current role with a CCR tribute band called Completely Credence that recently sold out Campbell River’s 467-seat Tidemark Theatre. All of which is simply to suggest that, when artists book time with Richard in his humble recording studio—especially when they also book accommodation at the Recording Studio Getaway—they’re getting much more than what they pay for. Evidently, the value of Jeannie and Richard’s Getaway is not going unnoticed. In the four months following that initial booking in July, the vacation rental has been booked eight times by guests from across Canada, from the Okanagan to La Belle Province. While two bookings a month may not sound like much, when you consider the fact that the Spencers basically created their escape on a whim and have done no advertising other than posting a listing on Airbnb, it’s virtually meteoric. Founded in 2008, Airbnb touts itself as “the easiest way for people to monetize their extra space and showcase it to an audience of millions.” The way it works is simple: anyone with space they’re willing to rent out, be it a vacation property, a guest suite or even just a spare bed, can list it on the site. Travellers scour the site looking for affordable or unique accommodations; if they like a particular offering, they can book it online right then and there. As of this writing, airbnb.ca boasts more than 2,000,000 listings (including more than 1,400 castles according to the website) that span nearly every country on the planet. Though she’d heard of the site before, Jeannie says she didn’t think seriously about Airbnb until a girlfriend told her she’d been using the service to rent out a spare room in her downtown Vancouver apartment. What really struck a chord with Jeannie, she says, was that her friend couldn’t stop raving about all the great people she’d met just by offering them a place to stay. For better or for worse (Airbnb has its share of critics, and not just from hoteliers), the Spencers have discovered just how easy it is to turn an empty room—or in their case an entire empty floor—into both an income-producing property and an opportunity to expand their social horizons. Jeannie’s words echo those of Airbnb co-founder and CEO Brian Chesky during a recent interview for Inc. Magazine, which named Airbnb its Company of the Year for 2014. For their guests, say Jeannie and Richard, that rich social experience is what it’s all about. It was that realization, in fact, that catalyzed their second offering on Airbnb—an experience arguably even more distinctive than a vacation rental that comes with its own recording studio. In August, after seeing the popularity of the Recording Studio Getaway, Jeannie and Richard decided to spruce up their old Airstream camper, add a few homey comforts and post their second Airbnb property: The Airstream Getaway. From the tidy stack of firewood lying in wait next to the fire pit, to the unopened box of pancake mix (and even an egg!) awaiting guests in the Airstream’s cozy kitchen, the Spencers have done all that they can to create yet another magical experience on their quiet property on the edge of the forest. Because, again, the experience is what it’s all about. The Recording Studio and Airstream Getaways are located on Timberlane Road in Courtenay. Find them on www.airbnb.com or call 250-898-8373.